This past week a friend and I had the opportunity to ascend the highest peak in the continental US, Mount Whitney at 14,508 ft. 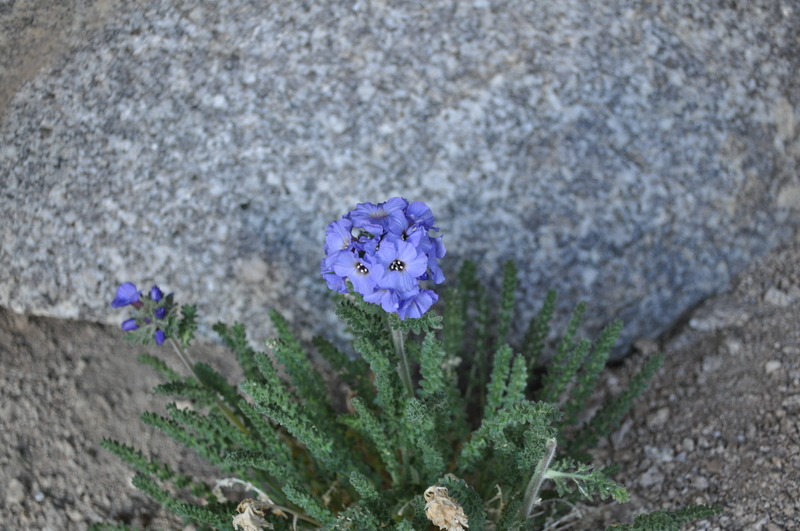 Located near the southern tip of the Sierra Nevada Mt. 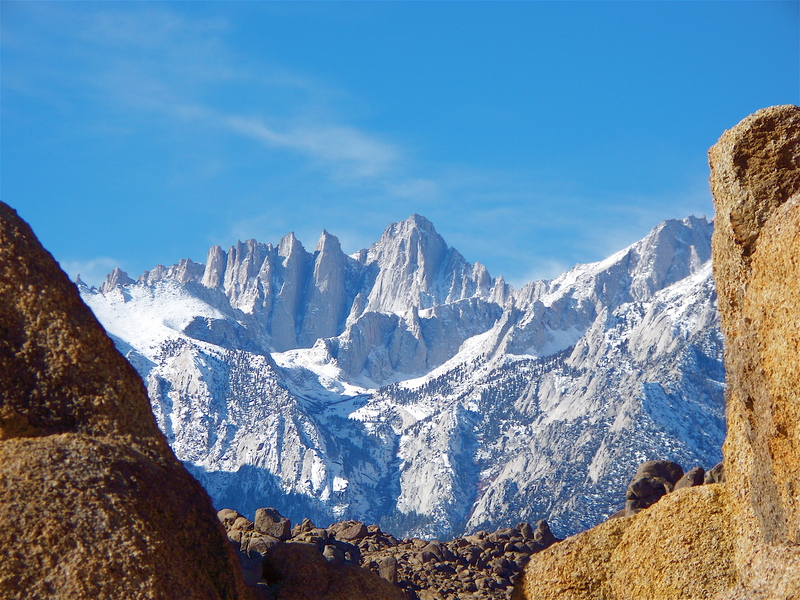 Whitney is one of the most popular peaks to climb due to its “easy” access from the East. An Approach from the western side will take around 6 days, depending on your exact route and effort. 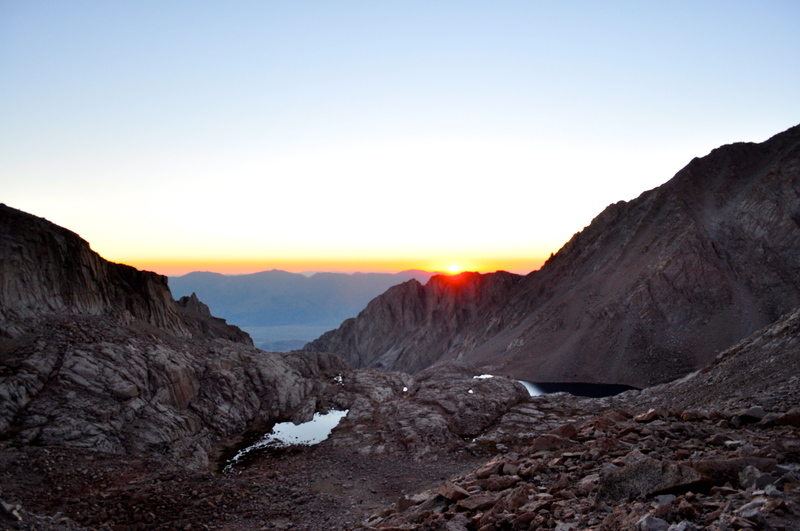 The standard approach from the East is an eleven mile hike with around 6,000 ft elevation gain from Whitney Portal to the summit and another eleven miles down. Many people do this in a day effort, but smarter people will include an overnight stay at one of the two available camping areas. 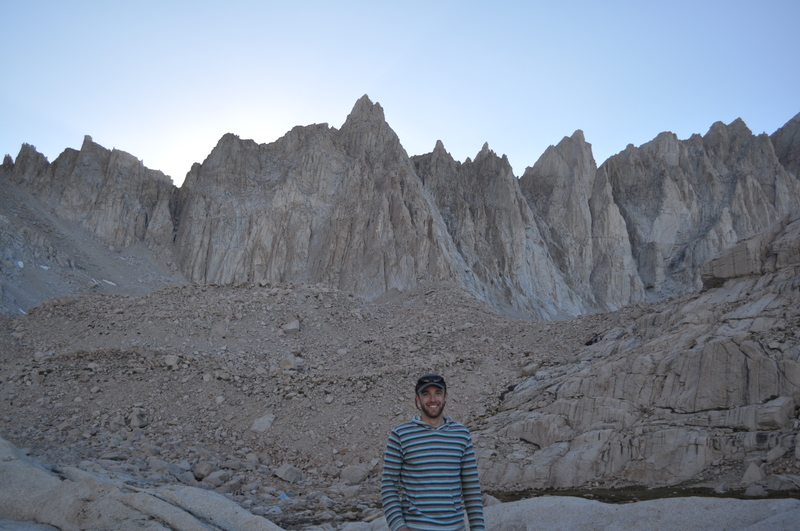 Hope you enjoy my writeup about our summit of Whitney! About a month ago a friend invited me to head out to California to conquer Mt. Whitney. Having never done a fourteener before I jumped at the idea! I have been so focused on cycling the last year that my adventures have really taken a hit, I needed an adventure. I also have been wanting to check out the Sierra Nevada for a very long time. The only catch in doing Whitney is the process for getting a permit. 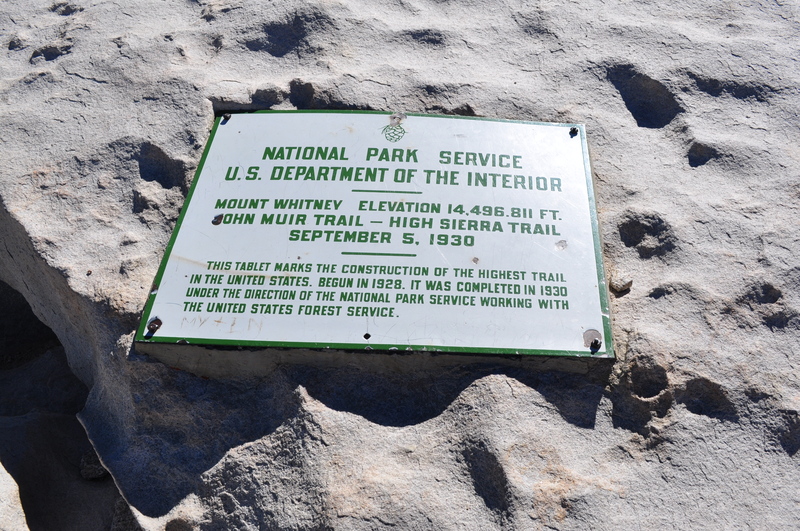 Due to the large volume of people attempting to summit the park service went to a lottery system a few years back. Now, you have to strategically select the dates that give you highest chance in obtaining a permit. One method is to choose the middle of the work week, which is why I got to skip town in the middle of the week! This is mainly an issue for backpackers. Most of the day hikers are able to pick up left over tags. When planning out the trip I for some reason wanted to make it as compact as possible. I guess to spend the least amount of time away from work and wife. In hindsight, I should have taken more advantage of the opportunity and explored more of the area. I flew out on a Tuesday to Las Vegas, drove to Lone Pine, climbed a mountain and returned to Las Vegas on Friday. Why I didn’t use the Labor Day holiday more is a mystery to me. Driving from Vegas to Lone Pine takes you through some of the most scenic desert settings to be found as you descend into Death Valley and out again. Temperatures in the valley were only 115 degrees making me think it would be a fun place to explore in the middle of winter. Once you finally come around the mountains and near Lone Pine you get a good look at the Sierra Nevada, this was a welcomed site. I met up with my friend who was coming form New Jersey to LA to Lone Pine. We ate some lunch, bought some supplies and headed up to Whitney Portal for the night to camp at the hiker campsites near the trailhead. 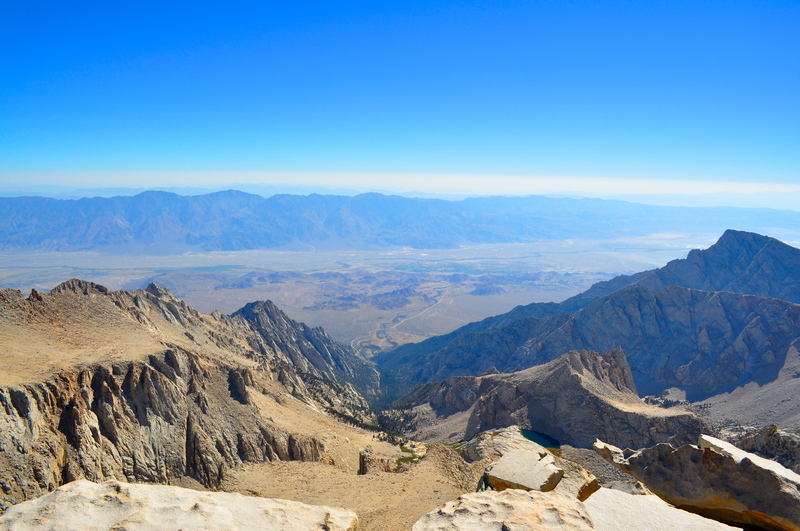 In the short 13 mile drive from Lone Pine to Whitney Portal you climb nearly 4,500 feet. The campsite is located in a tight glacial canyon. Lone Pine creek, with its crystal clear water, flows near the campsite setting the outdoor mood as you hear it tumble through the inclined pitch. The campsite is very popular for day hikers and backpackers because it has toilets, bear boxes and a convenient store with showers! When the sun went over the ridge around 6:45 the camping area got quiet as people started to hunker down for the night, getting as much rest a possible before they hit the trails the next morning. The area where we pitched our tent was right next to the stream and about 6 other tents. The young lady who’s tent was parked next to ours was hitting the trail at an eye squinting 3 AM for a day attempt. I really had no idea what was in store the next morning, just that it was going to be hard. We put up our food in the bear boxes and got into the tent. Despite the excitement, I ended up getting a good nights rest. We emerged from the tent in the morning to find the majority of others had already packed up and hit the trail. We took our time though, enjoying some breakfast at the convenient store. I got the largest pancake I have ever seen. After finishing, we organized our packs and hit the trail! The trail immediately goes up and then it goes up some more. After going up for a little while you go up again. 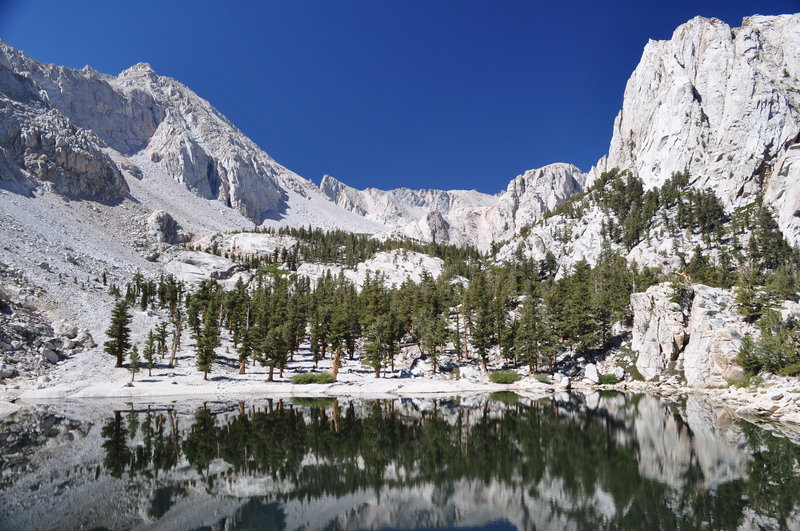 After about 2 miles and and 1,500 ft elevation gain you reach Lone Pine Lake. Here we took a little break to snap some photos and eat a snack. I saw a few fish in the lake which made me regret not bringing my fly rod. After another 1.5 miles you reach Mirror Lake at an elevation of around 10,600. From here the trail heads straight up and past tree line. We made sure to soak up the shade while we still could. As you keep trucking along you’ll see Consultation Lake in the distance before you reach trail camp right around 12,000 ft, which is where we camped for the night. We quickly setup camp and stretched out the legs. Hiking with the backpack on definitely requires some muscles I haven’t been using much lately. There was a constant stream of people coming into trail camp either heading in for the night or coming down from the summit on their way to Portal. One group came down to find their tent had been ransacked by the infamous marmot. They had left their tent zipper up, which would make sense to me, and the marmot decided it wanted in, so it chewed a hole though the front door. Luckily, the destruction ended there. A group from Tennessee said that the rangers had instructed them to leave their tent open to avoid marmot/squirrel tent renovations. I was happy to get this memo before we left our tent unattended. 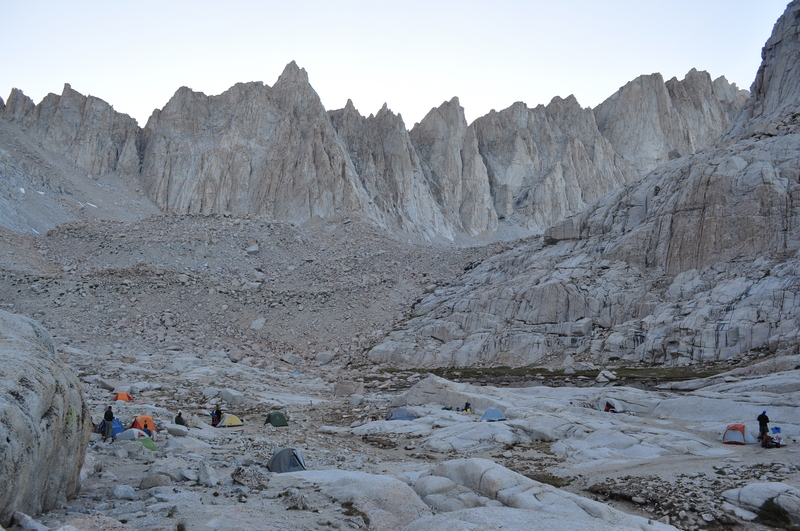 Trail Camp is the nearest campsite to the summit of Whitney on the East side and sits right below one of the harder sections of trail, the 99 switchbacks. The camping area has a small pond where you can filter water out of and is relatively flat making it pretty ideal for an overnight stay. As the sun neared the ridge line we cooked our gourmet meal, rice, and snacked on a few more items. We wanted to get an early start for our ascent, so we hit the sack pretty early. In the middle of the night I was awoken by my tent compadre, he was doing some star gazing that couldn’t be missed. Too bad I have no idea what I am doing with my fancy camera or I would be able to show you how amazing the stars actually were. It is easy to forget when you are in the middle of a city just how many stars there are. Looking towards the 99 switchbacks you could see the headlamps of a group of 5-6 people heading down in the dark of night. On the morning of the ascent we woke up at 4:45 to get a nice and early start. There were already a good amount of people tromping through to start the 99 switchbacks which lead you to the ridge. About 3/4 of the way up the switchbacks we were greeted with a beautiful sunrise over Death and Owen Valleys. I tried to get a few pictures of this, but again my novice photography skills didn’t do it justice. Around this same time we reached a point on the trail known as the cables. Due to the trail nearing a pretty sharp incline/cliff the forest service has put cables on the trail to help you along your way. This time of year the path is pretty wide and safe, but in the early season the path can be packed with ice and snow in this section making it pretty ominous. We caught up with a couple from Germany who were spending their vacation hiking in the Sierra, the lady kept saying her legs could go no more and then she would run off. There might have been a little language barrier in our conversation. Once we reached the ridge, trail crest, we sat down and took a good look at the West and East sides. The view here is amazing. 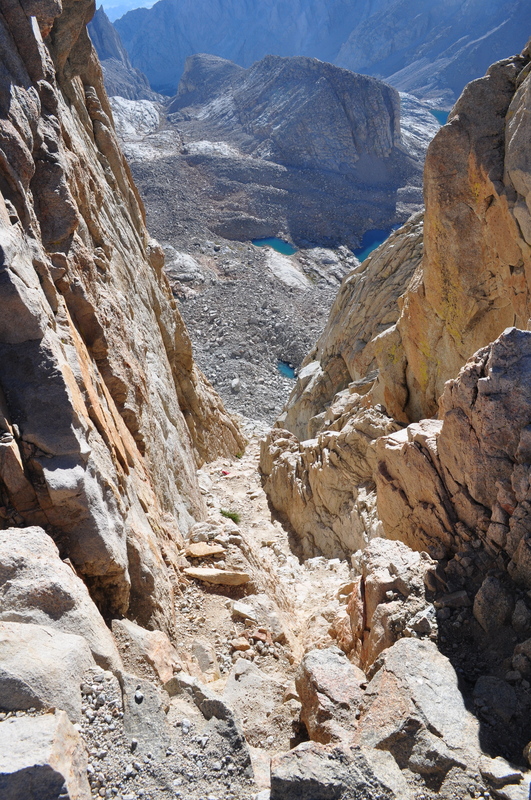 From here you descend to the junction with John Muir Trail and begin the final 2 mile uphill section to the summit. These were two of the longest miles I have ever gone, probably because I was so excited to get to the finish or maybe the lack of oxygen to my brain. As we made our way to the summit we would stop to look through all of the windows along the way. 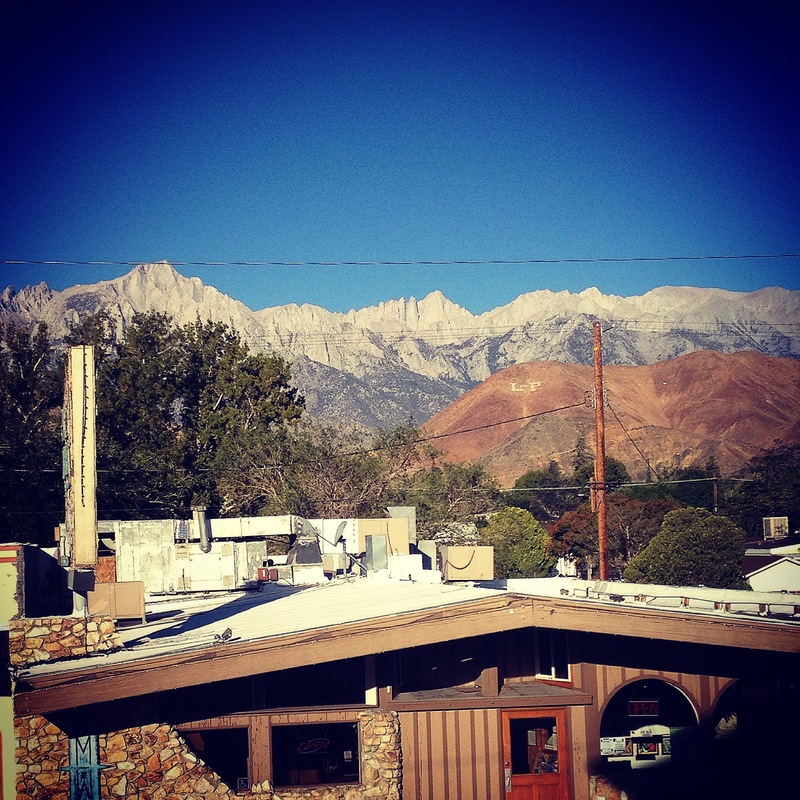 The windows give you an amazing view out to Lone Pine and Owens Valley. Finally, as you approach the summit you see the Summit House, a structure built for hikers to provide lightening protection, although there has been one death inside the building do to lightening strike. Once I saw the summit house I booked it up to the summit to celebrate our achievement. The views were amazing, looking over many alpine lakes and cirques. The friend and I had recently been nominated to do the ALS ice bucket challenged, so we thought it was the perfect setting. Some guys told me to take my shirt off for it, and for some reason I did! You can watch our challenges here. 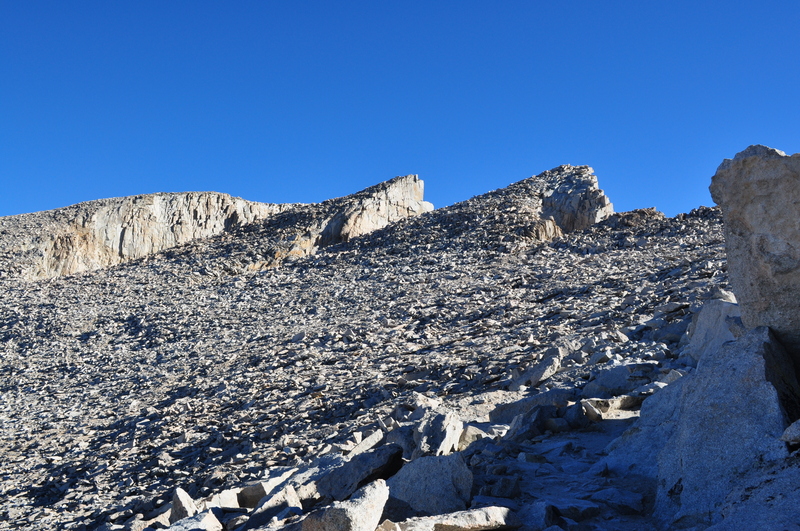 We spent a good amount of time on the summit talking to fellow hikers, some who were on their final day of John Muir Trail a 211 mile trail from Yosemite to Mt Whitney. One day, I will experience that trail! 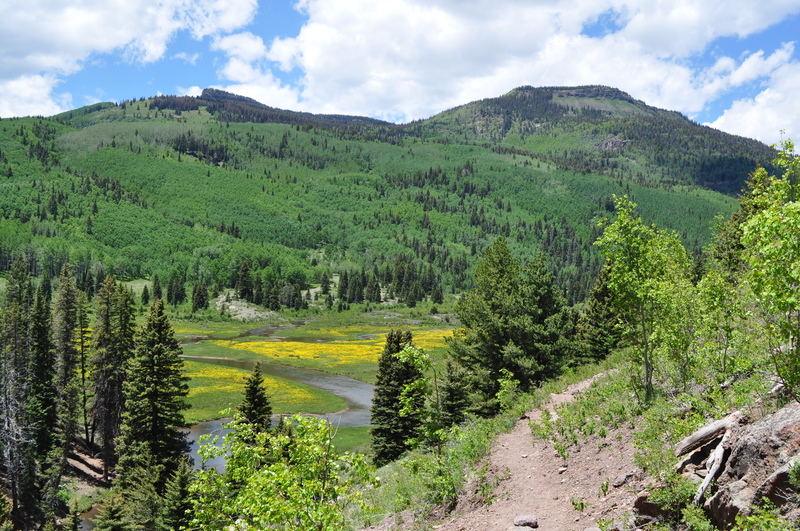 After getting our taste for altitude fulfilled we started the 11 mile journey back to the trailhead. Every step meant more and more oxygen as we descended. 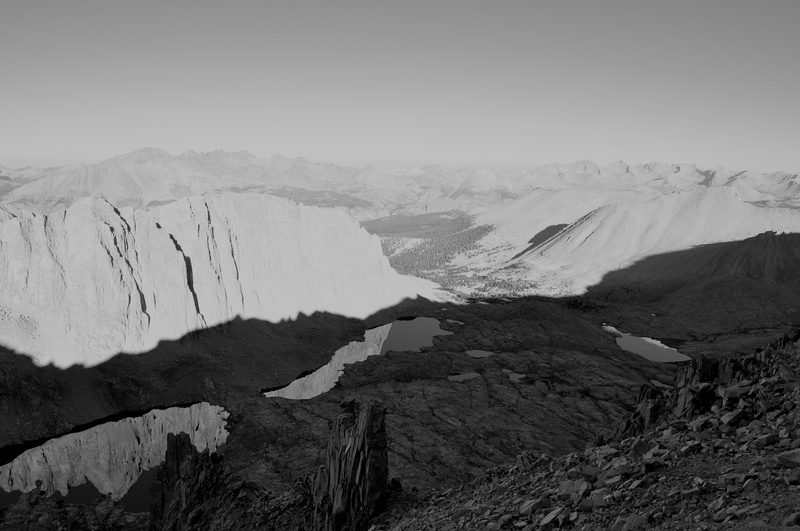 Once at the bottom, thanks to the Whitney Portal store, I enjoyed an ice cold beer… well maybe two. We headed back down to Lone Pine for the night where we stayed at the Lone Pine Hostel. In the morning I snagged an espresso from the local shop and enjoyed the awesome view from the hostel! 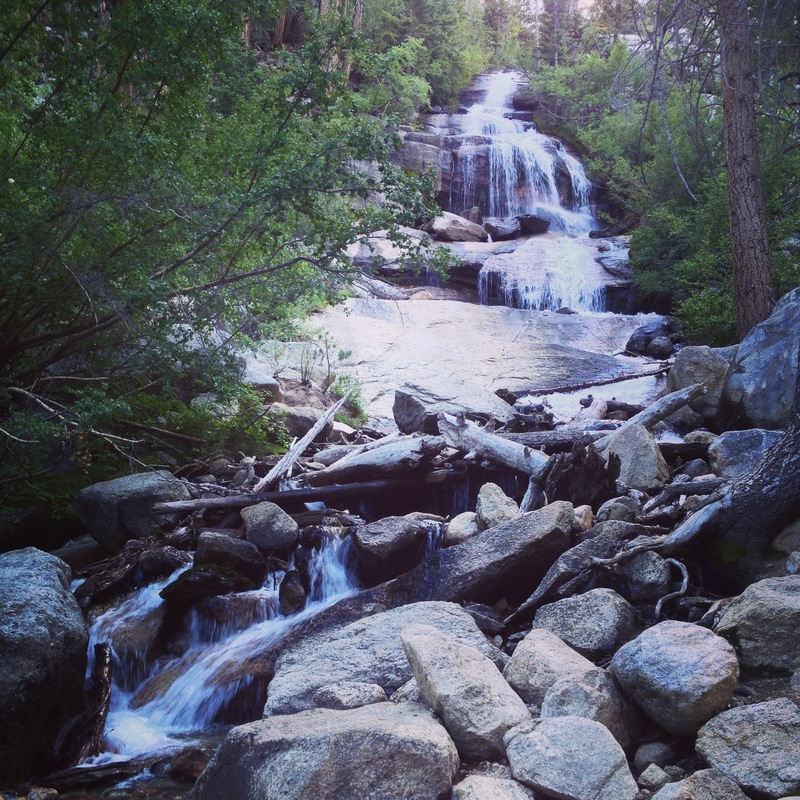 This was a very fun hike and I really enjoyed the Sierra Nevada as well. They are so much different than the Rockies. If you have the opportunity to do this hike I highly recommend going. Enjoy some of the other pictures below. Thanks for reading! Below are links to the hike elevation profile. Had a great week in Germany. Happy to be home with the family, though.